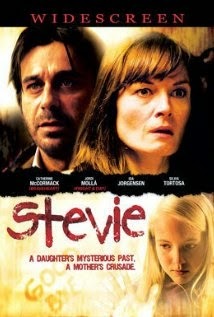 Movies like Stevie remind me why I hate independent films. This low-budget piece of crap was terribly written, poorly acted, and made me actually appreciate The Good Son. A couple adopts an angelic child. Bad things begin to happen to them. We're meant to wonder, does this perfect child really have an evil imaginary friend or is she just evil?! Unfortunately, no one will ever believe that this kid is evil. Seriously. I don't think she could have acted evil had she been a tiny blonde serial killer in real life. In fact, all of the acting is wooden and lacks any urgency whatsoever. The writing is extremely heavy-handed. The "clues" to who the evil entity really is are so blunt and obvious that you'd have to be a complete moron not to figure them out before the end of the first act. Has Catherine McCormack given up on acting? On life, maybe? The woman is a well known stage actress and was in award-winning flicks like Braveheart. What the hell is she doing in this movie (aside from turning in the worst possible performance of her entire career). Watching this movie has robbed me of 94 minutes of my life that I'll never get back again.